I received a wonderful present from my son abroad. He had written another similar title, Happy Father's Day on his blog, mobchina.blogspot.com. Yes! He was right! I had taught him the good and bad part of life when he was growing. Knowing just the good isn't sufficient because one has to understand the bad to appreciate what is good. I have been a good naughty dad to him since he was a baby. Today, I had breeded him as another good naughty person who is strong and independence to challenge the world. I know he has the abilities and strength to understand the meaning of life. I wish him a Happy Father's Day as well, as he has to teach his own children now from the other side of the world. I had done my part and I expect him to do his. 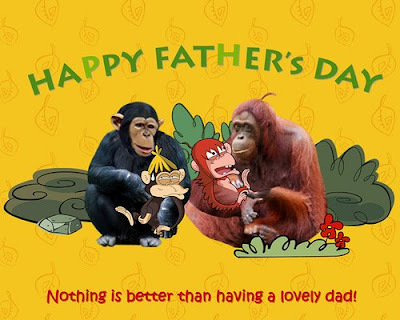 I take this opportunity to wish all my male heros a Happy Father's Day too. If you are reading my blog, I am sure you are one who is seeking for knowledge and learning to do well in life. I sincerely hope this little sharings on this blog can make all, a better father for our children. Food for thought - "Nothing is thicker than the father blood for his children."